What a fantastic year for Hungary’s top female referee, Katalin Kulcsár. 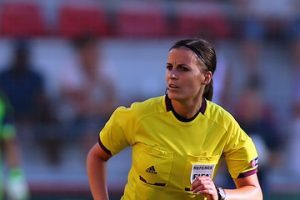 The 31-year-old has been an international referee since 2005, having refereed her 1st International match in September 2004, between Malta and Bosnia and Herzegovina. Last season she officiated three UEFA Women’s Champions League matches in her 6th season at that level, including the goalless quarter-final first leg between Barcelona and Paris Saint-Germain in Spain, before being awarded the honour of refereeing the 2016 UEFA Women’s Champions League final between Wolfsburg and Olympique Lyonnais. Katalin already has a FIFA U-17 World Cup final under her belt, having refereed the final in 2009 between Germany v Spain. She also appeared at the UEFA Women’s Euro’s in 2013, her fantastic performances in the group stages earning her the quarter final between Italy v Germany. She was also chosen for the FIFA U-20 Women’s World Cup in 2014, refereeing 2 group stage matches. She also refereed at the group stage in the FIFA Women’s World Cup in 2015. Fantastic to see our female referees getting the honours, they deserve. Outside of refereeing circles the questions were being asked: "Why was Viktor Kassai only given a Europa League game on MD5? "; "Is Kassai being punished for poor performances? "; "Has Kassai been demoted?" The answer quite simply is No. 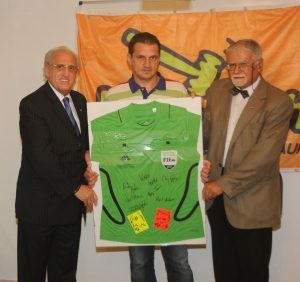 The date was a significant one in the Hungarian refereeing calendar for one reason and one reason only - it was the farewell match of Gábor Erös. It was his last appearance with his FIFA badge, his farewell on the International football scene. It was with this in mind that Collina allocated the match to one of his trusted elite referees, Viktor Kassai, Gábor Erös had been Viktor's senior Assistant referee for 8 years, before he stood down from his team in 2014, due to his health. It was a fitting tribute to a legend within the Hungarian & International refereeing community to have his close friend with him as he bid farewell to his International career. Born in St George's Field, Esztergom on 5th September 1971, he remains in the area to date with his wife and their 3 children. Despite FIFA relaxing the retirement age for match officials, the MLSz still enforce retirement for their match officials in the December after their 45th birthday, therefore Gábor will hang up his flags on MD19 (10th December) bringing an end to 22 years of being a match official. It all began for Gábor when he took his referee exam in Budapest in February 1994, his first match coming a few months later in the Hungarian Youth leagues on 27th August 1994, in a match between Nagysáp v Tarjan. His first match in the adult leagues was just 2 months later on 24th October 1994 - Dömös v Kesztölc. He made his debut in the NB3 in 1996 & continued his rise in the professional leagues until his NB1 debut on 17.03.2001 in the match between Videoton v Újpest. 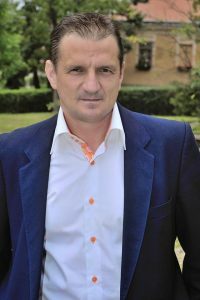 Attila Dubraviczky was was referee and György Koch, the senior AR. Since that date he has gone on to officiate in 303 NB1 games, 274 as Assistant Referee and 29 as a 4th Official. Gábor made his International debut on the same day that his number 1 fan (my son!) was born! 23.10.01 in a match between Croatia v Syria in Zaprisce, in the Alpen Adria Cup. He didn't however earn his FIFA badge until 1st January 2003. Champions League Final, Wembley. May 2011. 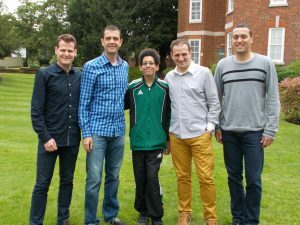 It wasn't all plain sailing for Gábor, when he returned to Hungary following the World Cup in 2010, he was getting pains in his stomach. Several examinations later he was diagnosed with Kidney Cancer and in October 2010 underwent a 7 hour operation and follow up treatment. His return to football came just 4 months later and just 7 months after his surgery he was at Wembley as part of Viktor Kassai's team in the UEFA Champions League Final. 5 months later Gábor was back in the hospital having a 5cm cyst removed from his thyroid, thankfully on this occasion it was not malignant. Following the Champions League Final, Gábor held an auction with a referee shirt from the 2011 final, signed by the full match officials team and Viktor Kassai's red and yellow cards, also signed by the match officials team. 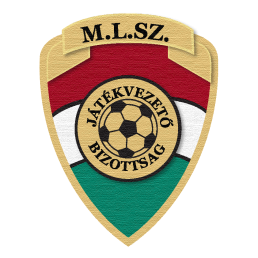 The money raised was split 50-50 with the Gyermekrák Alapítvány (Children's Cancer Foundation) and the Magyar Rákellenes Liga (Hungarian League Against Cancer) sharing the 455,000 Ft raised. In 2014 Gábor's final match as part of Viktor Kassai's International team was at Wembley for an International friendly between England v Peru. I had the pleasure of accompanying my son to the game after David Elleray had invited him as the match officials guest, so that he could meet his refereeing heros. To this day Gábor and my son remain friends and I have nothing but respect for him, such a beautiful heart. Congratulations on an absolutely amazing career, Gábor, the NB1 lose an outstanding match official in 2 weeks time, when you hang your flags up domestically as well. I hope that he continues as a referee coach and mentor in Komárom-Esztergom County, he has so much to give to the next generation of referees and I for one look forward to seeing his eldest son, currently a county level referee, maybe one day follow in his footsteps. Good Luck for the future.